The Voorwood Series A517 Shaper Sander will profile and sand to a single edge of a board in one pass. Rectangular panels can be contoured, shaped and sanded by this machine. 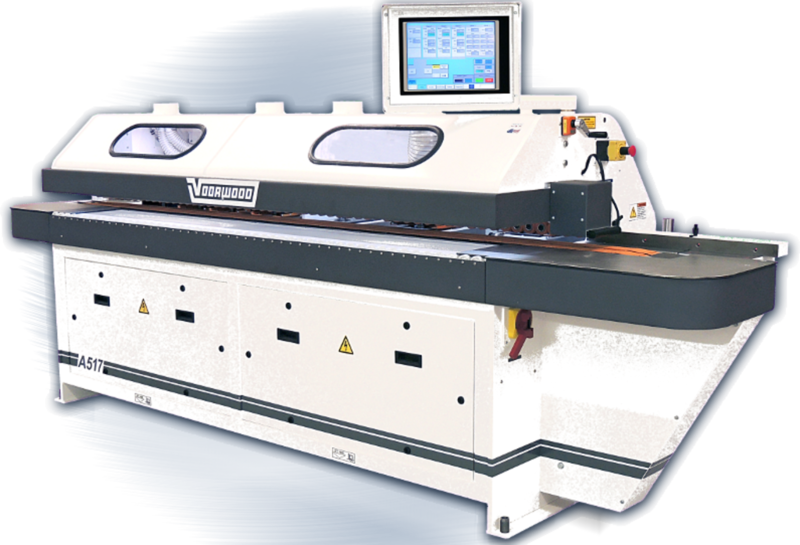 The A517 can accommodate up to seven shaping/sanding stations and is capable of producing up to 23,000 lineal feet (7000m) of finished product per eight-hour shift. Production rates may vary with part size, operation mode and operational conditions. Stock is transported through the machine by a bottom feed chain with special pads, which grip the stock securely while it passes the workstations. With digital readouts and MicroPoint tilt at the workstations and digital readout on the ever-square infeed guide, this machine is designed for easy set-up and repeatable tool change between profiles. The welded box frame construction provides a rigid structure insuring accurate and repeatable tool positioning. Base weldment is pre-drilled for permanent machine installation. The transporter assembly incorporates a large infeed support area and is equipped with an ever-square infeed guide with digital readout; adjustable feed drive motor and bottom feed chain. Substrate is positioned on infeed plate against the edge guide; when drive motor is activated, bottom feed chain transports the substrate past the shaping and sanding stations. Bottom feed chain is topped with nonmarking polymer pads. A PLC controlled oil pump automatically lubricates transporter chain race assembly. The steel plate holddown beam is equipped with a safety switch at the infeed area, anti-intrusion hood and non-marking rubber belt. The belt holds the substrate against the bottom pads while the work piece is transported past the shaping and sanding stations. Infeed limit switch deactivates drive motor if substrate is mis-fed. Digital readout on vertical adjustment hand wheel adjusts for substrate thickness. Non-marking outboard rollers support the weight of extra wide substrates as they are transported past the shaping and sanding stations. ONE REVERSING SPINDLE CNC SHAPING STATION: The reversing spindle can be set up to rotate with or against the direction of feed. The spindle has angular and vertical adjustments with accurate and repeatable digital readouts as well as spindle locks to facilitate fast and repeatable tool changes. The station is equipped with a dust hood/safety guard. The station can be horizontally locked for straight shaping or CNC controlled to shape preprogrammed contours. The CNC shaping station is equipped with a precision-balanced drive motor and spindle. A PLC controlled servo motor drives the shaper horizontally as a function of the transporter speed to produce a preprogrammed contour, and can also be used as a jump shaper to eliminate blow out on straight and contour cuts. drive motor cannot be activated when spindle is in the unlocked position. hood/safety guard. The stations can be locked for straight sanding or allowed to follow a contour.